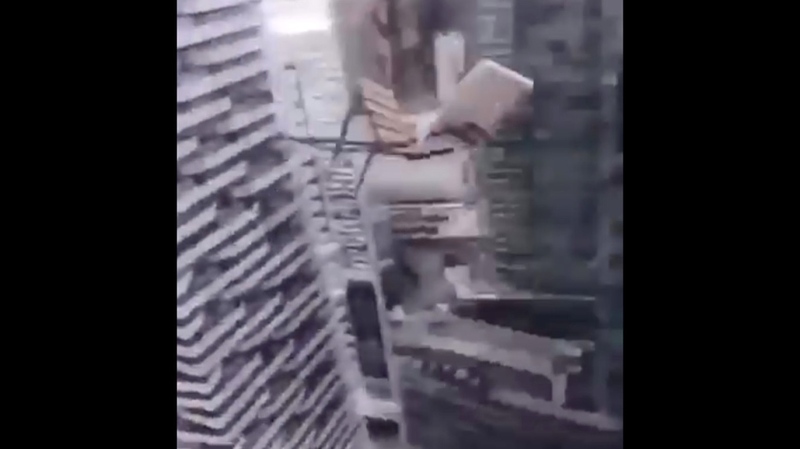 An alarming video of a woman tossing a chair off the balcony of a downtown Toronto highrise, toward the Gardiner Expressway below, is now the subject of a criminal investigation. 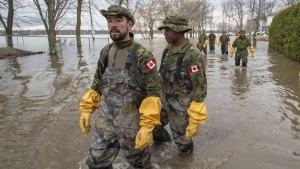 Toronto police confirm the cybercrime unit is looking into the video, which began circulating online over the weekend. The short, nine-second video was taken from “a very high floor” of a building near the Gardiner, at Harbour and York streets. In it, a woman stands on a condo balcony and lobs a small chair over the railing and onto the highway below. The video ends before the chair hits the ground. Police believe it was flung from 20 to 30 storeys up. “Outrageous, that’s what I would say,” Toronto police spokesperson David Hopkinson said of the video. Police said multiple items were thrown off the balcony on Saturday morning, at about 10 a.m., when the video was taken. The chair and other items reportedly landed at the front entrance of another condo building in the area. There was no word from police on whether any vehicles were damaged or if anyone was injured. Investigators are looking at whether the condo unit was being rented out at the time of the incident. The young woman in the video has not yet been identified. “Some of these buildings are not only condominium buildings, they’re hotels. Some people rent their homes out for the weekend. So that is part of the investigation -- that we would seek information from the concierge or from security or management -- but it won’t only involve that,” he said. She has been described as being in her 20s, approximately five-foot-one to five-foot-two, 110 pounds with a slim build and long blonde hair. In the video, she was wearing a black leather jacket, black clothing and black high heels. 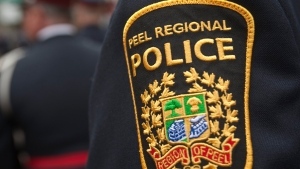 “Anytime you do something that endangers the life of others, particularly in the public, that warrants a criminal investigation,” said former Toronto police detective and CP24 crime specialist Steve Ryan. Anyone who recognizes the woman in the photograph provided by police is being asked to contact them or Crime Stoppers anonymously. 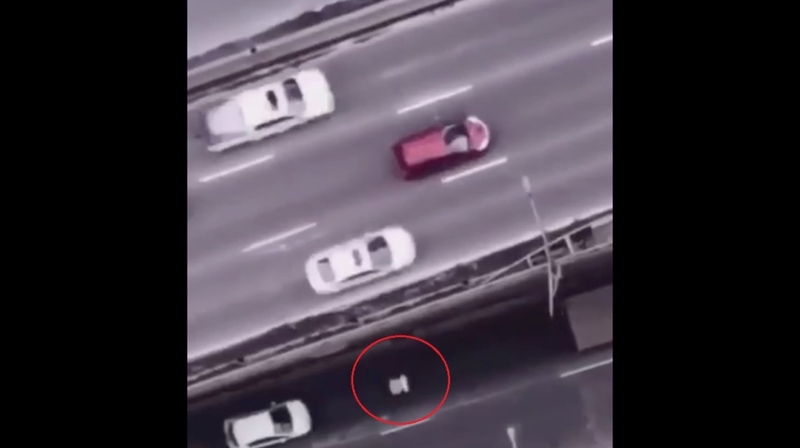 Toronto police are investigating a video that shows a woman tossing a chair off a balcony onto the highway below. In this image, a chair falls toward the Gardiner Expressway after being tossed over a balcony in Toronto's downtown core.